Have you ever uploaded a picture to Facebook and been unhappy about the portion that shows up in the box on your timeline? Have you ever noticed that on someone else's timeline? Did you know you can change that? Here is a quick video to show you how that is done. Why Don't My PowerPoint Animations Work? 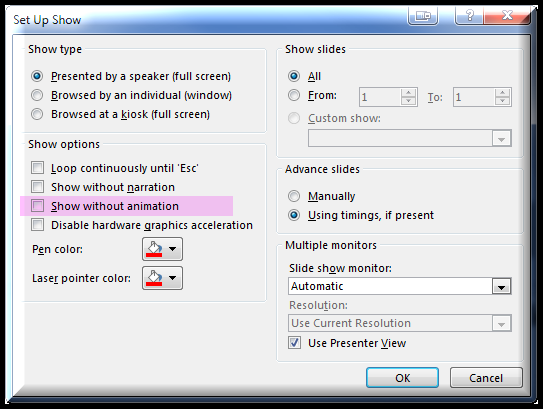 Have you ever created a PowerPoint and spent all kinds of time putting animations together only to find that they don't work when you go full screen? Maybe you have had one sent to you and the animations don't work but the creator claims that they worked fine before they emailed it. OK - so here is just one thing you can check as part of your troubleshooting. I know that this little spot is often overlooked as folks will spend all their time focused on the animation tab looking at timings and that sort of thing. Here is a short video to see it.